Back in 2011, I amused myself for a few months at this blog by posting examples about of international organizations that had come out against subsidizing biofuels like ethanol. For example, in a June 2011 post, "Everyone Hates Biofuels," I pointed out a report in which 10 international agencies made an unambiguous proposal that high-income countries drop their subsidies for biofuels. I followed up with "The Committee on World Food Security Hates Biofuels" in August 2011 and "More on Hating Biofuels: The National Research Council" in October 2011. The main arguments were the same: 1) subsidies for biofuels added to demand for corn and grain products in a way that pushed up food prices worldwide, with an especially harsh economic effect on the poorest people in the world who spend a large share of their incomes on food; and 2) the purported environmental gains from biofuels weren't happening, in part because after taking the environmental issues involved in plowing additional cropland into account, there was no overall reduction in carbon emissions. Over the years, I have become accustomed to the sad reality that global policymakers do not kowtow to my will. But I cannot forbear from noting that biofuel subsidies remain a mistake in both economic and environmental terms. Here are a couple of recent examples. Kimberly Ann Elliott has (optimistically) written "The Time to Reform US Biofuels Policy Is Now" as a May 2015 "Brief" for the Center for Global Development. It draws upon her longer January 2015 CGD "Policy Paper," called "Biofuel Policies: Fuel versus Food, Forests, and Climate." I'll draw on both papers here. 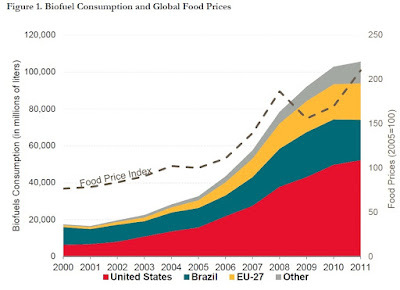 Let's start with a big-picture overview of how government subsidies and mandates drove up biofuel use, and what happened with global food prices at about that time. As biofuel consumption rises, global food prices rise, too. "The [grain] price jumps since 2005 are best explained by the new policies causing a sustained surge in demand for biofuels. The resulting reduction in available per capita supply of food and animal feed could not be accommodated by drawing on available stocks, as they had in the past when there were temporary shortages created by yield shocks. Instead, the necessary adjustments included an expansion of global net acres planted to grains, especially in Latin America and the former Soviet Union, and by reduced per capita consumption of grains and products from animals fed on grains. ... The rises in food prices since 2004 have generated huge wealth transfers to global landholders, agricultural input suppliers, and biofuels producers. The losers have been net consumers of food, including large numbers of the world’s poorest peoples. The cause of this large global redistribution was no perfect storm. Far from being a natural catastrophe, it was the result of new policies to allow and require increased use of grain and oilseed for production of biofuels." Estimates of GHG [greenhouse gas] emissions over the full life cycle of today’s food-based biofuels vary widely, depending on how and where the crops are grown and how they are processed. Even when biofuel production is efficient, however, the net effect on climate change can be negative if it leads to direct or indirect land use changes. Thus, if producers chop down tropical forests in Brazil, Argentina, or Indonesia to grow sugar, soybeans, or oil palm to make biofuels, then the GHG emissions associated with the resulting fuels could well be higher than those of gasoline or diesel. In addition, to make up for the food and feed crops going into fuel tanks, either people must eat less or farmers must produce more. Some increased production could come from using existing farmland more productively. But if farmers respond to higher prices by cultivating virgin lands or converting forests, then those indirect land use changes will create additional GHG emissions that further undermine the case for biofuels." In a similar spirit, Wright notes: "Environmentalists have grown skeptical of the claimed reductions in greenhouse gas emissions associated with biofuels; indeed, the net effects of biofuels on emissions are now more widely believed to be at best dubious, due to inevitable induced land use changes ..."
In addition to not achieving Congress’s energy security or environmental goals, implementing the Renewable Fuel Standard (RFS) is becoming ever more complex. On the supply side, advanced biofuels that do not use food crops and are more climate friendly have not been developed as expected. Thus, refiners cannot blend fuel that does not exist. On the demand side, the bulk of the US automobile fleet cannot safely use gasoline with more ethanol. So the overall mandate target cannot be met. The assumptions undergirding US biofuel policy have not held. For a sense of these issues, consider this figure from Elliot. The area to the left of the dashed line shows what has happened in the past, while the lines to the right show the mandate levels imposed by the government for renewable fuels. A couple of problems become clear. There are legal mandates for using relatively large amounts of cellulosic biofuels in the future, even though little is being produced now. ("Cellulosic" biofuels are produced from plant material that is not a human food crop, including certain grasses as well as wood and the nonedible parts of plants.) Indeed, as Elliot points out, a farcical situation arose in which the Environmental Protection Agency fined oil companies $7 million a couple of years ago for not buying enough cellulosic-based biofuels to meet the mandate--at a time when it was not yet technologically possible to produce that quantity of cellulosic biofuels. Paying penalties for a standard with which it was impossible to comply understandably led to lawsuits. Moreover, discussions of renewable fuel discuss the "blend wall," which is the physical fact that ethanol is corrosive, and if most US cars use more than 10% ethanol, it will damage their engines. As shown in the figure, the "blend wall" is the amount of ethanol that could be used, given the amount of gasoline purchased, without breaking that 10% ceiling. However, the current mandate for ethanol is higher than the "blend wall," and it's not clear how this can be accomplished. In sum, American and European policies to promote first generation biofuels are failing to significantly contribute toward any objective other than providing additional subsidies to relatively well-off farmers in rich countries. The oil production boom in the United States is making biofuels practically irrelevant for US energy independence, albeit with troubling effects on greenhouse gas emissions. And poor consumers around the world are less secure as a result of higher and more volatile food prices. By pitting fuel against food, first generation biofuel policies are also creating incentives to convert forests to cropland, and that undermines the goal of reducing GHG emissions. Because of the relatively large, and growing, role that transportation plays in global greenhouse gas emissions, continued public investment in research and development on second and third generation biofuels is worthwhile. But current biofuel policies are doing little to promote advanced biofuels, and are helping little, if at all, with climate change mitigation in the meantime. As a practical person with an office in Washington, DC, Elliot offers a number of reasonable suggestions for moderate change in the renewable fuel standards, but her suggestions are prefaced with "[i]f elimination of the RFS [renewable fuel standard] is not possible." As an impractical person far outside the Washington beltway, I just emphasize that eliminating these rules would be the best policy. The primary government role in alternative fuels and biofuels should be to support financing of research and development. Perhaps someday cellulosic biofuels will become a practical reality. Other energy technologies like improved batteries or fuel cells or methanol also deserve research and development funding. 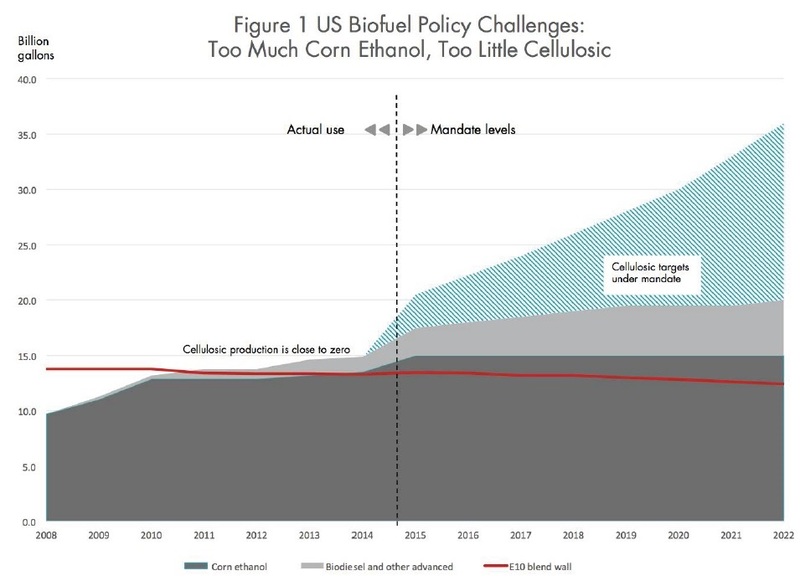 But federal mandates to use certain quantities of biofuels--quantities that will either harm existing car engines or which in the case of cellulosic biofuels don't even exist--are a counterproductive policy tool.